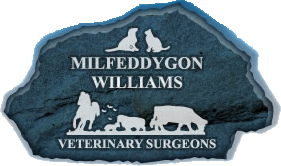 We just wanted to tell you a little more about some of the people at Williams Vets. Thanks for visiting! 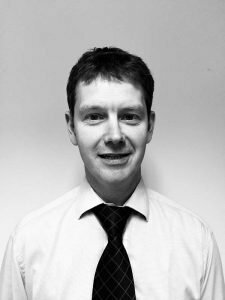 Hugh qualified from the Royal Veterinary College, London in 2001, and after a brief spell working for Animal Health during the Foot and Mouth disease outbreak returned home to work in the family practice. 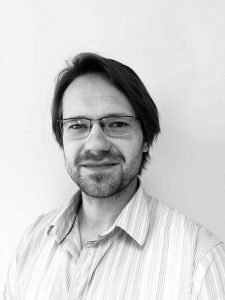 He has seen a lot of changes as the practice has developed including moving from a single room, consulting in the family home to a new purpose built surgery in Tywyn in 2009 and the opening of the new Branch in Barmouth in 2013. Hugh still enjoys consulting and meeting people and enjoys ophthalmology cases. He lives in Bryncrug on the family farm, along with his lovely wife Jess, twins Sara and Will, and their two rescue cats, Tom Tom and Squeak! 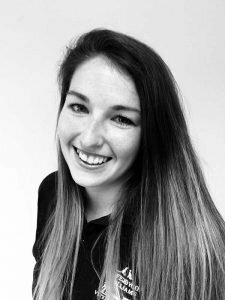 Rhian has seen practice with us from a young age, and after graduating from the University of Liverpool in 2010 came to work in the practice. 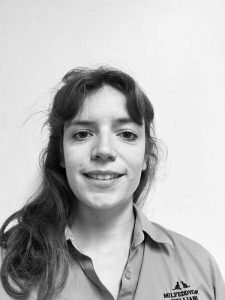 She spends most of her time in the Cemmaes Road branch and enjoys all areas of mixed animal practice, and particularly enjoys farm animal work and surgical cases. Rhian grew up in the Llanbrynmair area, and continues to live on the family farm and keeps a flock of sheep and a small herd of pedigree Welsh Black cattle. Outside of work she enjoys farming and meeting friends usually accompanied by her spaniels Jess and Elsi. Debbie has worked with Williams Vets since doing her A levels. She qualified as a vet from the Royal Veterinary College, London in 2008 and has been working with us since then. 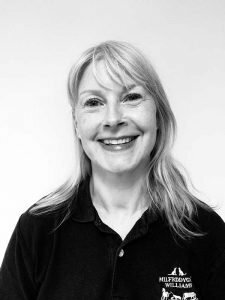 Debbie mainly works at our Barmouth branch and particularly enjoys small animal medicine and dermatology. She grew up in Machynlleth but now lives in Llanelltyd just outside Dolgellau with her husband and 2 young children and her 2 Pygmy goats! Outside work she volunteers and participates in the Dolgellau Parkrun and enjoys walking and cycling with her children. 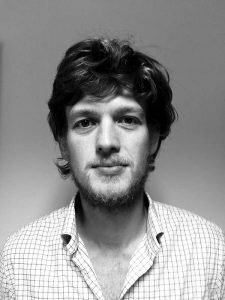 Ed graduated from the University of Liverpool in 2009, and after spending his first year of mixed practice in Orkney he joined the practice in the spring of 2010. At work he especially enjoys jobs that involve surgery or imaging either in our small animal clinics or out on farm. Ed lives locally with his wife Sara, two children, Hippo the cat and his African cichlid fish. In his spare time, Ed can be found on stage singing with the local male voice choir, duets with Sara, or acting in the local Aberdyfi panto. He also loves to row on the estuary with Aberdyfi Rowing Club. John joined Williams Vets in 2014, having spent 2 years at a mixed practice in the lake district. He enjoys all aspects of mixed veterinary work, and is kept busy at home having moved to the family farm in Aberangell. He has a flock of Whitefaced Woodland Sheep, and is a keen and active member of the Society. Amy grew up in Galway, Ireland and came over to wales in 2015. Since joining the team in August of the same year, she has enjoyed all aspects of mixed animal practice, especially small animal surgery and being out on farm. Having settled in well to the welsh lifestyle, she lives in Pennal and in her free time enjoys socialising and walks with her black Labrador Penny. 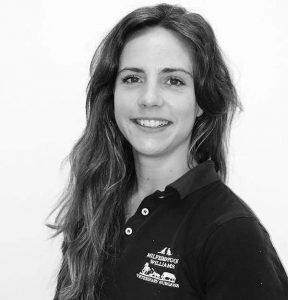 Alice grew up just outside of London, and has visited family in the Llanegryn area for years before joining the practice after graduating from Bristol Vet School in 2016. She loves working with a mixed species caseload and is very keen to increase our involvement with our sheep farmers outside of lambing time. She has recently been working with our farm clients and sheep specialists to design a new service for farmers looking to push down stubborn disease problems and increase productivity through more targeted fluke and worm control through the flock health club. She has been learning Welsh at evening classes and is in training for an open water swimming event this year. She’s keen to have a go at any activity that gets her out into the fresh air! 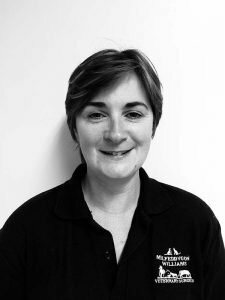 Jude joined the Williams Vets team in 2009 having previously worked as a senior accounts clerk for over 20 years. She is married to a local Bryncrug farmer and has 2 children. In her spare time she enjoys trail running and regularly competes in local events. Gwenan started working with us in 2006 after finishing her Animal Management Course in Llysfasi College. 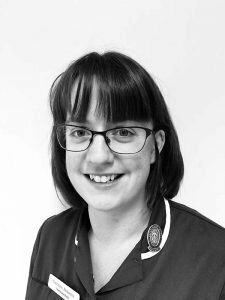 She qualified as a Registered Veterinary Nurse in 2012 and enjoys all aspects of her role, with a keen interest in theatre work and microscopy. She lives locally to the Cemmaes Road branch with her farmer husband and three children, which we can safely say keep her busy out of work! She enjoys attending the local pilates group and catching up with friends over some fine gin. 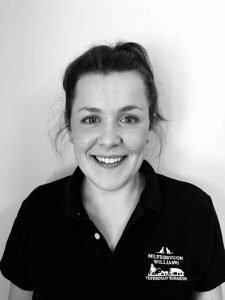 Alaw started working for us in the summer of 2009 as an Assistant Veterinary Nurse after completing an Animal Care and Management Course at Glynllifon College. She particularly enjoys large animal work especially lambing time, and assisting with small animal dental procedures. Outside of work she enjoys netball, hiking with her terrier Gelert and a good pint of lager in the local pub. 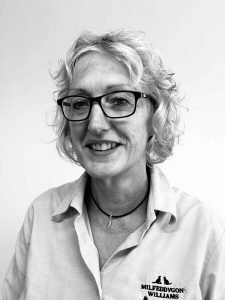 Jenny has lived in the Machynlleth area since a young age, and has been with the practice for a number of years. 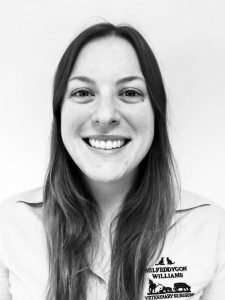 She enjoys caring for animals within the practice, and in her free time enjoys walking her Boston Terrier Lyra and spending time with her daughter Jess. 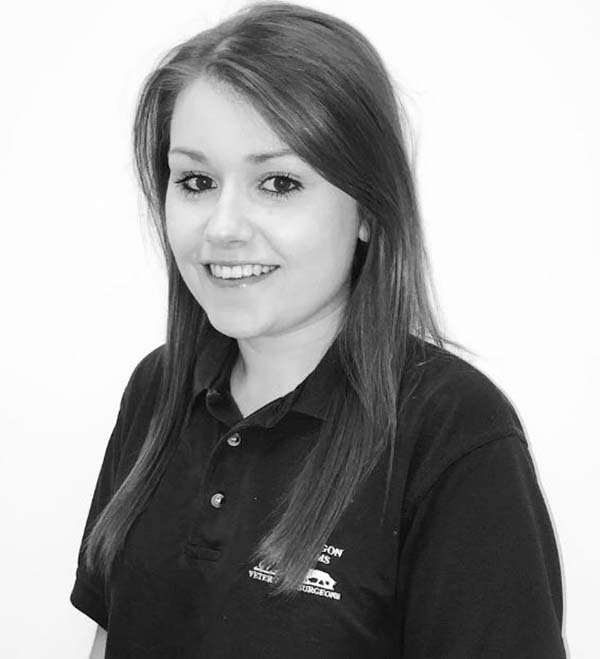 Originally from Bryncrug, Becca joined the practice in 2012 after studying agriculture in Glynllifon for two years. 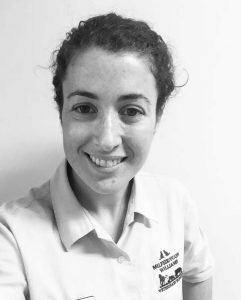 She enjoys all aspects of her work as an assistant veterinary nurse, from assisting with small animal surgeries or out on farm with the vets. She loves walking in her spare time, and very rarely is she seen without her black Labrador Jini. Becca is currently on maternity leave having had her little boy John in February, but will be back with us at the end of the year. Clare joined us in February 2017 as a receptionist and works at our Barmouth branch. Originally from Dolgellau, she now lives in Bontddu on the family farm rearing beef and sheep with her husband Gethin, four children and a variety of animals! In her spare time she enjoys walks with the dogs, playing netball and rowing with the Meirioneth Yacht Club. Catrin joined the practice in March 2018, and grew up locally on her family’s beef and sheep farm. 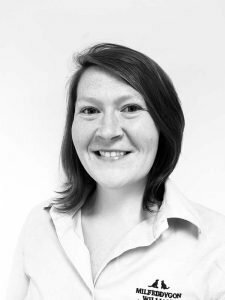 Catrin enjoys working alongside local farmers and pet owners. Outside work Catrin helps out with the busy family business, plays netball, and is an active member of Dinas Mawddwy Young farmers. She can also be found racing with the Aberdyfi rowing club at the weekend. Amy joined the practice as a trainee veterinary nurse in March 2018 and is starting college in September at Glynllifon . Amy grew up in Penuwch, Aberystwyth and lives with Lleucu Llwyd, her adopted cat from the surgery. Amy enjoys the new challenges of working in a mixed practice, and especially companion care. Outside work Amy enjoys cooking up tasty food, yoga and climbing up mountains.